Another proof of how extreme Chinese people are raving about the new Iphone 6 has emerged online as reports of a Hongkong man was caught trying to smuggle 94 IPhones to China. Photos shared on China’s Sina News online showed a man whose body is covered by iPhone 6 and 6 plus all over being inspected by a port official. 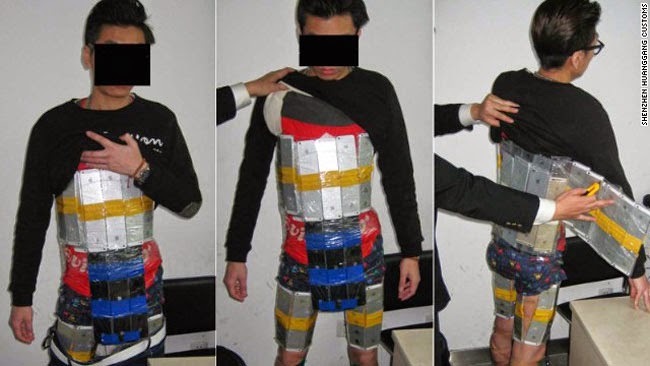 A total of 94 iPhones were confiscated which were strapped on his body using a masking tape. The arrest was made at Futian Port, an immigration port of entry between Hongkong and Mainland China. Port officials became suspicious because they noticed that the man was walking strangely. The iPhone 6 had since been released in other parts of the world last year but its released was delayed in China last September 2014. It was rumored that the Chinese government had been interfering with its release by not approving a network license to Apple due to alleged national security threats. Others thought that it may be a supply chain issue or a way of Apple’s retaliation due to design leaks that happened to the new iPhone model in China. Nonetheless, the device was released a month later. Whatever the real reason behind the delay of the release date, it only made iPhone fans in China more eager to get their hands on the latest model. The pre-order of iPhone 6 has since increased on Apple’s Hongkong website. It was also anticipated by the government that the smuggling of the said device would soar higher since one iPhone 6 would cost four times the Hong Kong price. The price of an iPhone 6 is significantly more expensive in China due to high luxury taxes. Nonetheless, China, along with India, are still two of the leading market for Apple. The scarcity of the phone, only made it more desirable to the people of China.